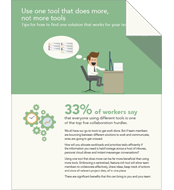 1/3 of workers say that everyone using different tools is one of the top five collaboration hurdles they encounter. While it’s tempting to adopt all the latest tools, the use of different, disconnected tools actually exacerbates the problem. Teams needs need an engaging, manageable tool that allows them to keep track of the progress of their tasks and collaborate with other members of their team. With one tool you can drive greater collaboration and communication across your team. Download this paper to learn more about the benefits of using one tool over many.